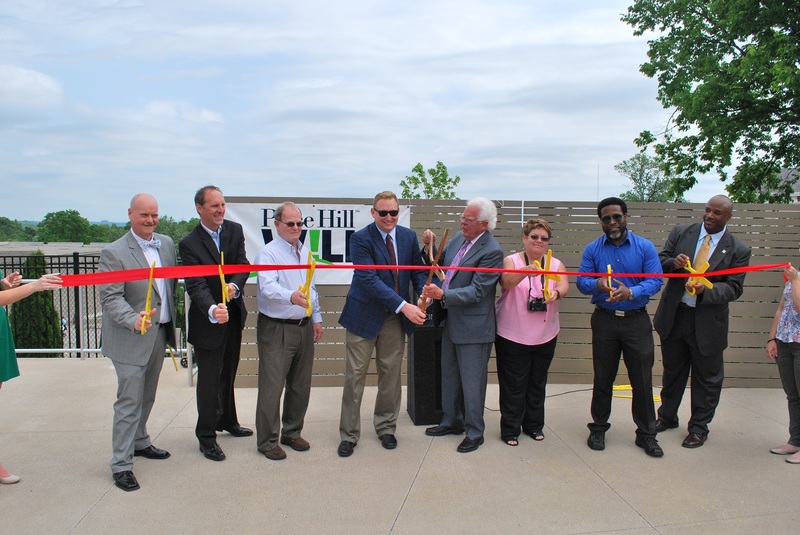 Yesterday the City of Cincinnati, Price Hill Will and members of the East Price Hill community gathered to celebrate the grand opening of St. Lawrence Square. Located at the corner of St. Lawrence Avenue and Warsaw Avenue, the opening of the new public park marks the culmination of a years-long effort to develop a community gathering place in the historic west side neighborhood. Assisted by Jeff Raser at Glaserworks, who has otherwise been well-known throughout the city for his work on developing form-based codes, members of the East Price Hill community came up with the idea for establishing a public gathering place, and subsequently developing the final product which includes a small lawn, performance stage, paver-covered walkways, and a water feature honoring the five branches of the military. The project was made possible through an unfortunate situation of a fire bringing down a historic structure. Following that, Price Hill Will acquired the property and received $261,595 in CDBG grant funds, along some grant money from PNC Bank and $20,000 of its own money to make it all happen. Following the grand opening ceremony, community leaders are not wasting any time programming and activating the space. A kickoff party will take place this Sunday at St. Lawrence Square from 4pm to 6:30pm. Event organizers say there will be live music, food and other activities to welcome the community to their new gathering space. St. Lawrence Square is located in the heart of East Price Hill. It is easily accessible from numerous bus routes; and free bike parking is also readily available in the immediate surrounding.